NEW YORK (AP) — With a public hearing looming and the threat of owners and league officials facing depositions, the NFL settled collusion cases brought by Colin Kaepernick and Eric Reid. MADISON, Wis. (AP) — Republicans who control the Wisconsin Senate refused to mention NFL quarterback Colin Kaepernick in a resolution honoring Black History Month passed Wednesday, rejecting calls from Democrats who said ignoring the Milwaukee native put them on the wrong side of history. Republicans who control the Wisconsin Senate are refusing to mention NFL quarterback Colin Kaepernick in a resolution honoring Black History Month. On a party line vote Wednesday, the Senate passed the resolution and rejected calls from Democrats who said ignoring the Milwaukee native put them on the wrong side of history. February is Black History Month. The Legislature's black caucus had proposed a resolution honoring a number of black leaders, including Kaepernick. 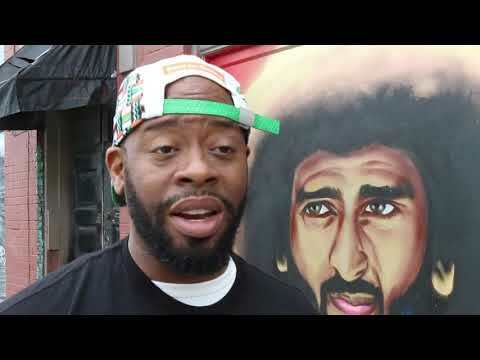 ATLANTA (AP) — The Atlanta artist community is responding in force after a mural featuring embattled former NFL quarterback Colin Kaepernick was turned to rubble days before the Super Bowl. ATLANTA (AP) — Julian Edelman is certainly a compelling story. A diminutive guy with a bushy beard, picked in the final round of the draft, defying the odds to become one of the NFL's top receivers. ATLANTA (AP) — Gladys Knight says her singing the national anthem at the Super Bowl will bring people together. NBC's "Today" show reported Friday that Knight wrestled with whether to join a boycott over the NFL's treatment of Colin Kaepernick, the former quarterback who protested racial injustice by kneeling during the national anthem. ATLANTA (AP) — "Tommie Smith's gesture continues to resonate. It has inspired similar gestures by men and women for whom Smith's iconic image is a symbol of courage and unity in the face of bigotry and injustice — most prominently, former NFL quarterback Colin Kaepernick, who refused to stand before football games during the U.S. national anthem to protest racial injustice in this country." — From the exhibit "With Drawn Arms" at the High Museum of Art in Atlanta. HOUSTON (AP) — DeAndre Hopkins says he arrived to Houston's game against the Cleveland Browns on Sunday in a No. 7 jersey bearing the hashtag "IMWITHKAP" to support Colin Kaepernick and his protests of social and racial injustice because: "he's standing up for what's right." SUNBURY-ON-THAMES, England (AP) — Philadelphia Eagles safety Malcolm Jenkins does not believe the heated exchange he had with the Carolina Panthers' Eric Reid diminishes the impact of his fight for racial and social justice. Jenkins, the face of the Players' Coalition, and Reid, a former member, shouted at each other during and after the Eagles' 21-17 home loss on Sunday. When former California Congresswoman Mary Bono took over as the interim president for USA Gymnastics last week, she pointed to the opportunity to "reconnect" with a sport she loved growing up. SANTA CLARA, Calif. (AP) — The San Francisco 49ers are apologizing for initially leaving Colin Kaepernick out of a photo gallery celebrating the team's history against the Green Bay Packers. CAMBRIDGE, Mass. (AP) — Former NFL quarterback Colin Kaepernick and comedian Dave Chappelle are among eight people being saluted by Harvard University for their contributions to black history and culture. The eight recipients of the W.E.B. Du Bois Medal are being honored Thursday afternoon by the Hutchins Center for African and African American Research at Harvard. CHARLOTTE, N.C. (AP) — Eric Reid called his return to the NFL on Sunday "bittersweet," saying it still hurts that his friend Colin Kaepernick has been "robbed" of his dream to play again in the NFL. CHARLOTTE, N.C. (AP) — Wide receiver Torrey Smith chuckled at the notion that Eric Reid's return to the NFL this week might be a distraction for the Carolina Panthers on Sunday when they host the New York Giants. Smith said Reid's stance on racial injustice hasn't been an issue in the locker room, adding that "no one cares" if he kneels or not during the national anthem. He said Reid's new teammates are more eager to see what he does on the field rather than what he does before the game. CHARLOTTE, N.C. (AP) — Eric Reid isn't planning on giving up his fight against racial injustice in America or his battle with the NFL. Patriots safety Devin McCourty says he's pleased that Eric Reid has signed with the Carolina Panthers and hopes that quarterback Colin Kaepernick might continue his career at some point, too. McCourty said Thursday that Reid "is a great player. A guy that I think we've all watched over the last couple of years go out and make plays. A starter since Day 1 in this league." CHARLOTTE, N.C. (AP) — Eric Reid's return to the NFL created a buzz around the league on Thursday, six months after he filed a grievance alleging collusion by the NFL to prevent teams from signing him because of his participation in racial injustice protests during the national anthem alongside former San Francisco 49ers teammate Colin Kaepernick. The furor seems to have largely died down and the company reported an earnings beat on Tuesday. How is Nike's new ad featuring former NFL quarterback Colin Kaepernick affecting the company's sales? CAMBRIDGE, Mass. (AP) — Former NFL quarterback Colin Kaepernick and comedian Dave Chappelle are among eight people being honored by Harvard University for their contributions to black history and culture, the university announced Thursday. NORTH SMITHFIELD, R.I. (AP) — A Rhode Island town council that approved a nonbinding resolution to boycott Nike products will revisit the question because of public backlash. Town Council President John Beauregard said Wednesday he has called a special meeting for Monday and plans to make a motion to recall the 3-2 vote from earlier this week . KENNER, La. (AP) — The mayor of a New Orleans suburb said Wednesday he is rescinding his order banning his city's recreation department from purchasing Nike products for use at city recreation facilities. MOBILE, Ala. (AP) — An Alabama reverend has cut up a Nike headband and wristband before his congregation to protest the company partnering with former NFL quarterback Colin Kaepernick. GRAND BLANC, Mich. (AP) — A Michigan teen was a part of Nike's latest commercial featuring Colin Kaepernick. The "Dream Crazy" commercial includes Alicia Woollcott of Grand Blanc, The Flint Journal reported. The 18-year-old was included in the ad because she was a linebacker on the school's football team last year, and was also crowned homecoming queen. Woollcott's appearance in the ad is accompanied by a narration that says "Don't settle for homecoming queen. Or linebacker. Do both." NEWTOWN SQUARE, Pa. (AP) — Tiger Woods endorsed Nike's latest "Just Do It" ad narrated by Colin Kaepernick with a message nearly as succinct. "It's a beautiful spot ," Woods said. The two-minute ad, which debuted during the NFL opener, highlights superstar athletes LeBron James, Serena Williams and others, and touches on the controversy of NFL player protests during the national anthem.